Goodreads Summary: Lady Alexia Maccon, soulless, is at it again, only this time the trouble is not her fault. When a mad ghost threatens the queen, Alexia is on the case, following a trail that leads her deep into her husband’s past. Top that off with a sister who has joined the suffragette movement (shocking! ), Madame Lefoux’s latest mechanical invention, and a plague of zombie porcupines and Alexia barely has time to remember she happens to be eight months pregnant. 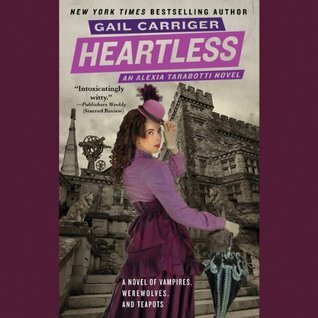 The Parasol Protectorate series has been such a fun series to listen to, and Heartless is no exception! There’s a lot going on, and nothing is keeping Alexia from figuring out who is behind a plot that is threatening the queen. Lord Akeldama has graciously agreed to adopt Alexia’s child, who is finally born! With a very interesting complication at the very end of the book, which will prove interesting for whatever happens in Timeless. We learn all sorts of thing about Lord Maccon, and that is something I wasn’t expecting! We learn the full details of why he left his old pack in Scotland and became the alpha of the Wolsey pack. And we also learn more about Alexia’s father, which was nice. I mean, we’ve heard him mentioned in previous books, and I like that we learn a few interesting things about him in each book. As for the current threat against the queen…while it was interesting to see Alexia try to sort it out…in the end, I wasn’t surprised by it. Understandable, of course, but not a surprise. And it led to an interesting change of scenery for the Wolsey pack and the Westminster Hive. Lord Akeldama is one definitely one of my favorite characters, and I’m glad he had more of a role in this book! While his nicknames for Alexia were adorable, they did start to get less amusing by the end of the book. Actually, I loved the characters a lot, and they’re entertaining, as always. As much as I love the series, and as much as I really liked Heartless, something felt missing, and I’m not sure what it is. It was amusing, but not as amusing as the other books in the series. Hopefully, everything will get back to normal in Timeless. As always, Emily Gray did a great job narrating, and I can’t imagine anyone else narrating the series! I really liked Heartless, and it’s a good addition to the series. While I wasn’t as entertained listening to it, I was still pretty amused. Heartless gets 4 stars.